Bangladesh is one of the developing countries of the world with a growing yet small sized economy. Resource constraint has become a major impediment towards achieving our development goals in health sector among others as well. Raising the level of nutrition and improving public health is a constitutional responsibility of the state. Health sector thus remains one of the leading sectors receiving development expenditures each year in Bangladesh. Successive governments of Bangladesh have also prioritized health agenda in the election campaigns and manifesto. Despite drawbacks over the years Bangladesh has made land marking achievements in some areas of health that has been acclaimed by world community. In 2010, the UN recognized the country for its exemplary progress towards Millennium Development Goal (MDG) 4 in child mortality and for being on-track to achieve the maternal mortality reduction goals of MDG 5. More recently, Bangladesh was praised as an example of “good health at low cost”. 31% population of Bangladesh lives below the poverty line that indicates the high dependency of a large number of people in an overwhelmingly 150 million’s nation on government. But unlike many countries, still the size of government budget is smaller in comparison with the demand. Volume of public expenditure in comparison with other countries is fairy low. Besides most of the public expenditures are not linked with sectoral and national policies. World Health Organization suggests that health budget should be at least 15% of the national budget for the developing countries. However, 15% allocation of budget for health sector is apparently a far away point down on the line in future budgets of Bangladesh as there are many other sectors competing for higher budgetary allocation. Even as we will proceed further, it will come out that the percentage share of health sector has fallen from poor to poorer sometimes. Bangladesh has a health system which is dominated by the public sector and the private sector is run by local entrepreneurs, different NGOs and international organizations. In public sector, The Ministry of Health and Family Welfare is the leading organization for policy formulating, planning and decision making at macro and micro level. Under the ministry four Directorates e.g. Directorate General of Health Services, Directorate General of Family Planning, Directorate of Nursing Services and Directorate General of Drug Administration are providing health services to the citizens. Since independence Bangladesh has made significant progress in health outcomes and the government has been pursuing a policy of health development that ensures provision of basic services to the entire population, particularly to the under-served population in rural areas. 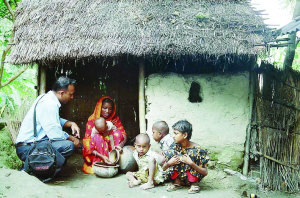 Within the overall development policy framework of the Government of Bangladesh, the goal of the health, nutrition and population (HNP) sector is to achieve sustainable improvement in health, nutrition and reproductive health, including family planning status of the people, particularly of vulnerable groups, including women, children, the elderly, and the poor with the ultimate aim of their economic emancipation and physical, social, mental and spiritual well being. Three sub-sectoral policies, i.e., National Health Policy, National Food and Nutrition Policy, and National Population Policy duly approved by the government from time to time are under implementation by the MOHFW. Non Government Organizations (NGOs) are significant and growing sources of HNP services in both rural and urban Bangladesh . Their services have mainly been in the areas of family planning and MCH. More recently, NGOs have extended their range of services and are now the major providers of urban primary care. In Bangladesh, historically, supply-side financing of health care services has been the backbone strategy for improving the access of poor households to essential health care services. A bulk of health care financing here is coming from out-of-pocket that indicates people are willing to pay for better care. More than two-thirds of the total expenditure on health is privately financed, through out-of-pocket payments. Of the remaining one-third (public financing), about 60% is financed by the Government out of tax revenues, development outlays, and the remaining 40% through international development assistance. An implication for this out-of-pocket payment for the population in the lower quintile is that they are forced to pay for health care when their ability to pay is at the lowest limit. Community financing mechanisms and risk-pooling systems are nearly non-existent except in small pockets of NGO innovation. A few NGOs have started a health insurance component within their package of micro-credit programs. Thus, Bangladesh directs a health system which is dominated by the public sector and the private sector is run by local entrepreneurs, different NGOs, and international organizations. Though finance minister lays out budget every year at parliament, public perception has not been much conducive towards it. Formulation of budget still remains a complex process with much of the ideas are geared from the top for implementing bottom level programs. There are several inconsistencies with the budget like overlaps between development and non-development expenditure. 5 year Medium Term Budgetary Framework (MTBF) had been in place for most of the ministries including Ministry of Health and Family Welfare (MOHFW) too since 2011. Most of the ministries have been digitized recently and there are some relevant information and links in most of their websites. But they are not continuously updated time to time. This often leads to the crisis of finding updated data. Though the budget document remains available, but how the different ministries are using their allocated amounts over last five years is missing for most of the ministries. Finance ministers have mentioned the total allocation for different ministries and some major programs in their budget speeches. But then how this total allocation is distributed among districts and sub-sectors still remains blurred for MOHFW. Burgeoning size of budget at every successive year has been a key feature in Bangladesh. In FY 2008-09, size of national budget proposed at the parliament was 99962 crore taka. Five years and it increased by 91% in 2012-13 while the size of proposed budget was 191738 crore taka. All of these budgets had deficit financing that was covered by loans from foreign and domestic sources. Non-development budget have always larger share in pie than development expenditures, yet with the debate on what is their actual difference is. Remunerations for doctors are considered under non-development expenditure while the cost of building hospitals is considered as development expenditures. Finance minister of the country has spoken of this inconsistency in most of his budget speeches as the border between these two is much overlapping. Due to this reason MTBF’s are now being developed with no such development and non-development differentiations. This increasing size reflects the increasing nature of Bangladesh economy with lot of hopes can be placed for higher allocations for different sectors in budget by government in years to come. Budgetary allocation for health sector has also grown in absolute amount within this time. Here it can be seen from the table above that 6092 crore taka was allocated for MOHFW in FY 2008-09. This trend has continued in subsequent years with 9333 crore taka being allocated in FY 2012-13. To the contrary, percentage share has experienced a downfall since FY 2011-12, with the downward trend continued in following FY too. 6.1 percent share of budget was granted for MOHFW in FY 2008-09 which rose to 6.2 percent in FY 2010-11. Going in depth of the budget for MOHFW reveals that non-development expenditures have been higher than development expenditures like the overall budget. Difference between non-development and development allocation has grown by 38 percent from 2008-09 to 2012-13. In absolute amount, both of these two sides have grown with greater allocation. In 2008-09 development expenditure for MOHFW was 2439 crore taka which rose to 3825 crore taka in 2012-13. On the other side non-development expenditure was 3653 crore taka in FY 2008-09 which grew to 5508 crore taka in FY 2012-13. Growing difference between development and non-development budget means that government has emphasized much on recruiting manpower in health sector in these years. In last five years Government of Bangladesh has established more than 11000 community clinics in distant areas of Bangladesh with the aim to support 6000 people with one community clinic. Community clinics were set up to provide Primary health care services, mother and child care, family planning services, sanitation, cleanliness, prevention of diarrhea, balanced food, nutrition and venereal disease related services. Some new medical colleges have been set up for training more doctors and along with them government has also trained a large number of nurses and medial assistants in last five years. Along with MOHFW there are programs in some other ministries that vibrantly contribute towards the development of health, like maternal health and child health. Allowance for poor lactating mothers was initiated in FY 2008-09 under Ministry of Women and Children Affairs (MOWCA) in FY 2008-09. In the budget of FY 2010-11 this allowance for lactating mothers was extended to urban areas under and a total of 58.6 crore taka was proposed for this program. This allowance will support lactating mothers and their new born babies and definitely contribute to their good health. Government also finances school feeding programs in schools of poor regions for improving the nutritional status of children. Large amount of money is allocated for these programs. But health data misses to account for this allocation and represents the low allocation as much lower. Analysis of last five years budget reveals that several programs for improving maternal health, maternal mortality and nutritional status of children were announced. But how much will be distributed for each of these programs are found missing both in the budget speeches as well as in the ministry websites.